This past weekend I helped Adam’s sister move to the coast/island (though technically it’s still attached to the mainland, you have to take a ferry to get there) and I brought along some baked goods to keep us ‘moving’ while unpacking boxes and setting everything up. I was happy to go, but I’m also happy its the last of the weekends away for a while. I was away three weekends in a row, first my bachelorette party, then a friends, and then moving. I know I’m home every day because of summer vacation, but having to go away and pack /unpack, and eating foods i usually never eat (and drinking far more than I do) throws me off and i hate it. this weekend is my cousins wedding and I’m looking forward to actually being home on the weekend with Adam instead of packing to go away. We only have two weekends before the wedding that we aren’t busy or out of town. Crazy. I cannot believe we are SEVEN weeks out from the wedding! The list of to-do’s is getting shorter, but we have a lot to accomplish still. finish up wedding signage – paint signs etc. plus I’m sure a whole lot of other little things! 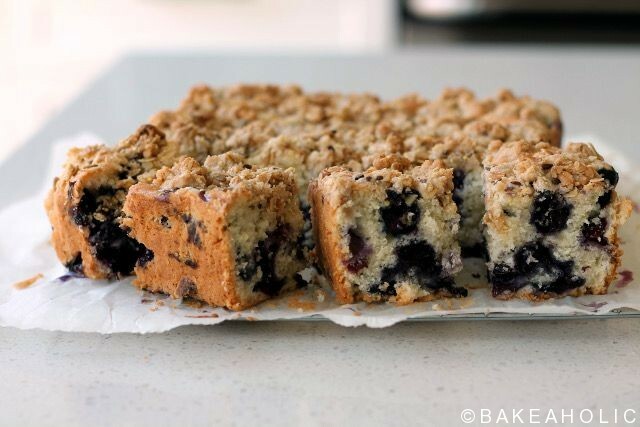 for now, i think i’ll sit back and have some iced-tea with a slice of this delicious, perfect crumb cake studded throughout with delicious BC Blueberries. Adam and I can’t stop eating them by the handfuls – we probably go through a box a day at this rate. 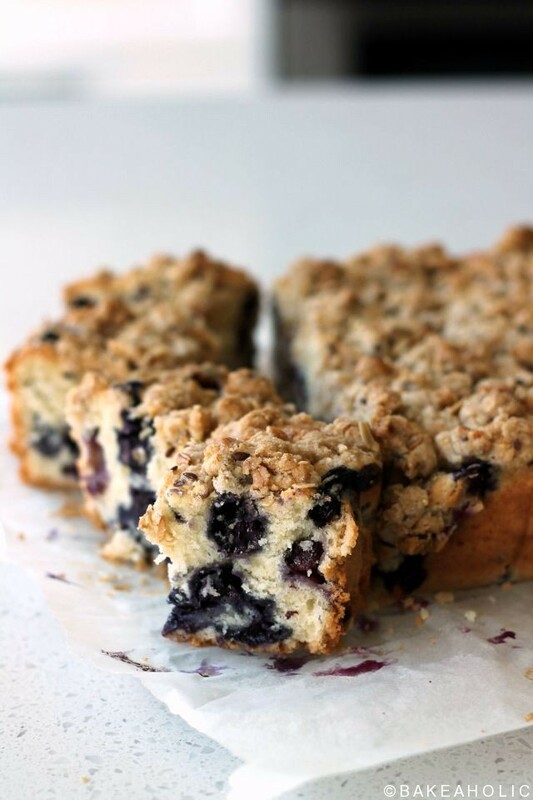 If you can’t get your hands on blueberries, this would be delicious with raspberries, strawberries, or even diced peaches. 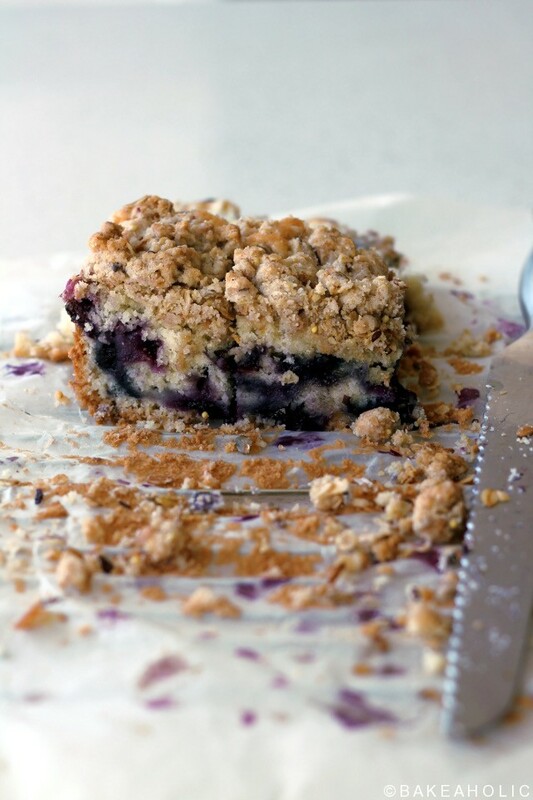 A tender, crumb cake studded with fresh blueberries. Heat oven to 375°F. Line a square 9x9 baking pan with parchment paper, set aside. Prepare the topping by mixing the flour, sugar, cinnamon, then cutting the butter in with a pastry blender until the mixture resembles coarse crumbs. Set aside. In a medium bowl, whisk flour, baking powder until combined. In a large bowl, beat butter, sugar and zest together until light and fluffy. Beat in 1/3 of the dry ingredient mixture until just combined, followed by 1/2 the milk; repeat with remaining dry ingredients and milk, finishing with the dry mixture. The batter will be very stiff, but don’t fret. 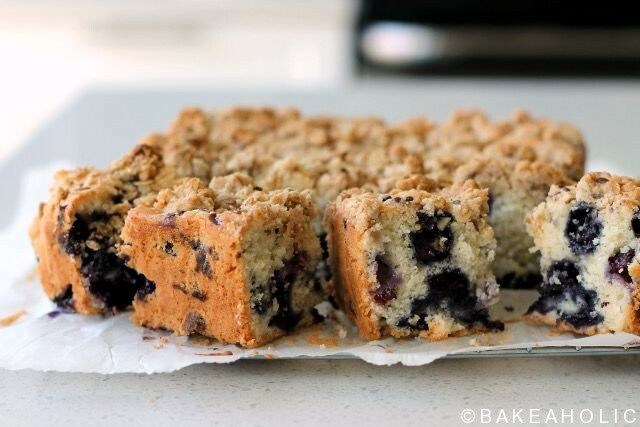 Fold blueberries into cake batter until evenly distributed. Scoop cake batter into prepared pan and smooth so that it is flat. Sprinkle with crumb topping. Bake in heated oven for 40-45 minutes, or until a toothpick inserted into the middle of the cake comes out batter-free. 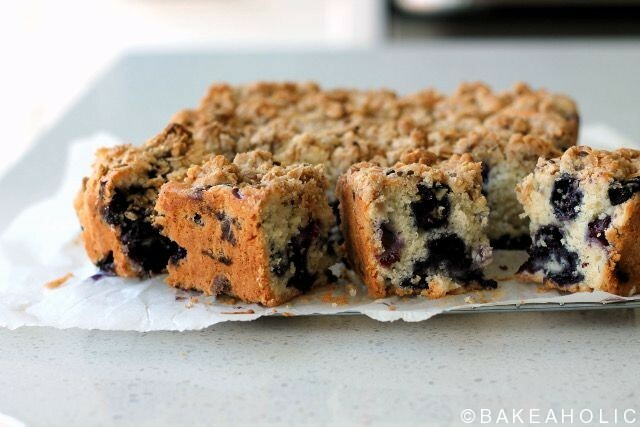 You can let the cake cool complete in the pan on a rack, or just cool it in the pan for 20 minutes before lifting it out of the baking dish by the parchment paper. cut into squares. Can be kept in tupperware on counter for a few days.